Tone Deaf Leopard | The Goose Is Out! Well for once words fail the Goose when attempting to describe Tone Deaf Leopard. If you have ever seen them, you will know what I mean. One of them did email Sue to say “I’ve just seen your picture on the Goose website – were you that person convulsing at the front in the scout hut at the Leigh festival?” Erm, yes, that was me. Go to the loo before you watch them, that’s (almost) all I have to say. One person made a quite succinct comment on a youtube clip (not included here ….) which said simply “s**t” 🙂 They didn’t get it, clearly. Or maybe they did. 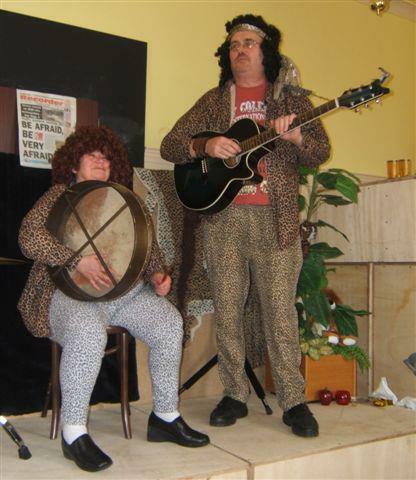 Who knows …..
Can’t find a website for Tone Deaf Leopard ….. but they run a folk club in Orpington. Click here to check out Tone Deaf Leopard’s folk club!